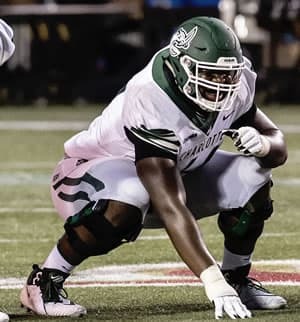 Charlotte 49ers redshirt senior offensive lineman Nate Davis has accepted an invitation to the 2019 Reese's Senior Bowl. A four-year starter, Davis was named Honorable Mention all-Conference USA in 2016 and 2017 and is a nominee for first team all-C-USA honors in 2018. He anchors an offensive line that ranks fourth in Conference USA in rushing in league games (163.0). The 49ers rushing attack has produced the 49ers first 1,000-yard rusher at the FBS level, Benny LeMay, who ranks second in C-USA with a 95.9 rushing average and ranks second all-time for the 49ers with 1,055 rushing yards this season. Davis has started each of the last seven games and 37 overall in his career. During the last six games, Charlotte has had four games with 140 or more rushing yards including 211 in the Homecoming win against WKU and a season-high 281 vs. FIU. In both 2017 and 2018, Athlons recognized him as a preseason all-C-USA Second Team player. This past year, SB Nation dubbed him the 49ers’ "Best Offensive Player" in its preseason publication. Davis is the second 49er to be invited to the Reese's Senior Bowl. Current Cleveland Brown Larry Ogunjobi, a first-team all-Conference choice in 2016, participated in the 2017 Senior Bowl. The defensive tackle was selected in the third round of the 2017 NFL Draft by the Browns, and is currently second on the team in sacks.